Feminism can be loud and in your face. Feminists can be unapologetic and radical in their statements. I could never bring myself to be abrupt with proponents of patriarchal views. Being a middle class Brit from a Soviet background, I withdraw from awkward situations and prefer to keep discussion within civil forms of defined discourse at conferences and letters to my MPs and to the BBC. People who know that I practise Buddhist disciplines might say that this also plays a part in my avoiding direct confrontation. It is true but only up to a point. I do not rush into an argument mostly because of my training not to rush into anything, but to first become mindful and see where the impetus for my action is coming from: is it something worthwhile or is it some undigested trauma from childhood? It is usually the latter. The historic Buddha, some people might be surprised to hear, was not a model of a saintly benevolence and kind words for everyone. In fact, if you read translations of the Pali Canon, in which the life and the Buddha and his community of monks unfolds, you will get glimpses of the character of the Enlightened One. 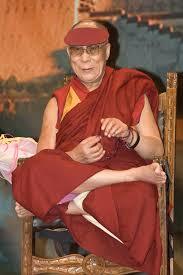 The Buddha was more like His Holiness the Dalai Lama: not trying to appear holy. Quite cheeky, in fact. Definitely irreverent towards the spiritual authorities of his day. There is a story in Sutta Pitaka, the Collection of Discourses, in the book Anguttara Nikaya, The Further-factored Discourses, 8:11. A Brahman of Veranja came to visit the Buddha with accusations mostly concerning his lack of respect for the existing spiritual mores. The Buddha gave him witty yet straightforward answers that could always be stand-up comedy, if we imagined that the Brahman was a heckler at a gig. 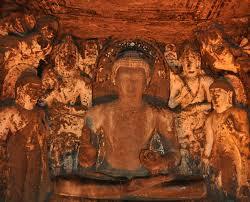 To each of these heckles the Buddha answers with an exposition of the Buddhist Dhamma. Oxana Poberejnaia is a content writer at http://content4you.org. She was an Officer of the University of Manchester Buddhist Society while studying for a PhD in Government, and has been involved in organising the Manchester Buddhist Convention, now in its 10th year. Oxana is now exploring the Sacred Feminine through marking seasonal festivals, working with her menstrual cycle, frame drumming and shamanic journeying, while keeping the practice of Buddhist meditation. Oxana is an artist and an author. Her works can be found on her blog. Love this, and it is nice to smile with ourselves too. Thanks, Oxana. The picture of the Dalai Lama, who seems to be wearing a red dress, I thought was an elder woman, possibly a nun, especially because of the pretty feet, but then I realized who it was. My second take on the photo reminds me of a teaching in Buddhism, the first being an illusion, the second sudden enlightenment. His Holiness the Dalai Lama is considered the continued presence of the historical Buddha in this world, is that right? I’m not sure what role the Dalai Lama plays in Buddhism? He’s not part of Zen Buddhism. Please teach. :-) Laughing out loud. I would only “teach” in terms of “give information”, as in Japanese “Oshiete kudasai”. So, here goes my limited knowledge: Dalai Lamas are believed to be manifestations of the Bodhisattva of Compassion, not the historic Buddha. However, live connection to the teacher is one of the primary aspects of Tibetan Buddhist faith. Each Tibetan Buddhist school (and the Dalai Lama is head of only one, which is the Gelug school, has a lineage, which traces a line of teachers, or lamas, all the way back to the Buddha. 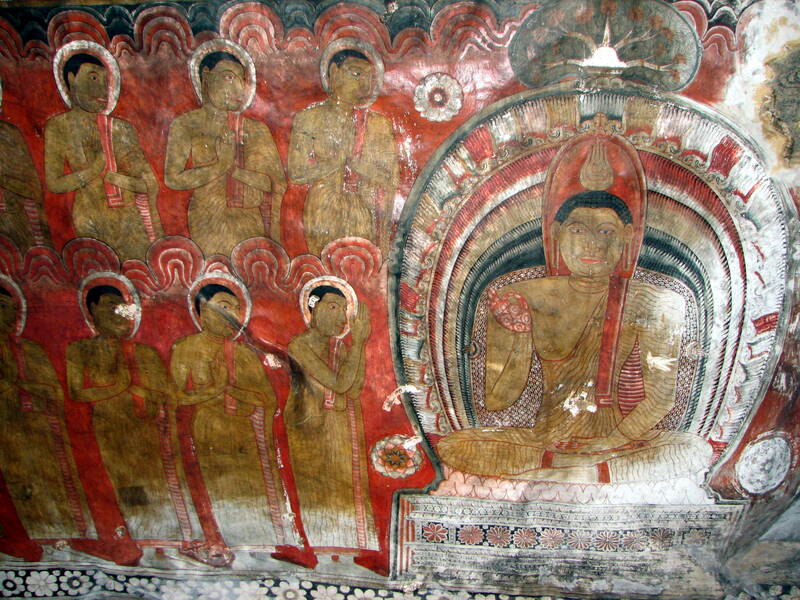 So in one sense it can be said that for the Dalai Lama’s disciples, he does represent the historic Buddha. To say that the Dalai Lama is not part of the Zen tradition would be accurate in conventional sense, but not in the ultimate sense, because it would be like saying that the Dalai Lama is not capable of Zen behaviour, or teaching the Zen way. And he is, of course. In the same way as Zen masters are capable of the same insights that the Dalai Lama is party to. Buddhist monks and nuns of different schools follow much the same monastic code, and can even cohabit in one monastery, which happens in practice. Tibetan abd Zen Buddhism can seem very different for an external observer. However, it is my humble opinion that all schools of Buddhism merely offer different paths, with their own particular emphasis on certain aspects of the practice and the teaching: for people more inclined to be devotional, intellectual, mystical, rational, psychological, social-action oriented, or anything else. I call this “compassion of the Buddhas” – it makes sure that a person of any and every intellectual and psychological disposition has a chance to achieve Enlightenment. Nicely done, Oxana! I thoroughly enjoyed this. Thank you so much for this, Marie! So kind! I find that asking questions is much better than getting into an argument. Questions bring thought; statements that insist on a (my) point of view often produce defensiveness. Thank you, Barbara! I know, right? Because when people state things they believe in my face, I just go: “Oh, no, here we go.” But, yeah, conversation and humour is always better. What is even better, I find is simple human contact and trust between people. For instance, my two best female friends are an atheist and a Protestant Christian. And they are really my best friends. They help me and support me in everything and I try to reciprocate, regardless of our differing beliefs. I like the “lead astray” and ” missed out on the rebirth” answer-zingers the best. Well done you. Thank you so much, nmr, this means a lot to me. What a refreshing contribution on feminism. Thank you! Thank you, Cynthie! Well, it’s all thanks to the Buddha and to all the extremely supportive hosts and co-contributors on this wonderful blog! Oxana, I loved your post! What a wonderful strategy to employ to bring the feminist message to Buddhists! And what a wonderful strategy for having a conversation rather than an argument with patriarchal apologists who attack feminism! It’s very similar to Tai Chi, where the energy of an attack is side-stepped and/or turned back on the attacker. Lovely! Hello, Nancy! Thank you very much for your kind words! Yes, Tai Chi, I agree! Feminism and Buddhism… Some lovely thoughts. Thank you, S.M Lowry! I am honoured. This just made my day :) Loved this post!!! I liked what Elizabeth Cunningham did there lol.